Those Who Fight Further: I'm Gonna Feed You to the Shivat! It's all down to this one arcade I went to many years ago. Back in the Space Year 1998, I was on holiday with my family in Majorca. For many nights during our stay, we went to a restaurant in Toranova for our meals, and next door was one of the local arcades- the whole of Majorca was littered with them, but this was the one we revisited the most. Now, at this point in time, the family's Mega Drive and NES collections had been sold off (yeah, I know, I know) so there was little time for 2D gaming in the house. The Nintendo 64 and Playstation were the order of the day (even if I was hilariously late to the party on them, getting them three or so years after they'd come out- this is a pattern I've done my best to continue) so the idea of being blown away by a 2D game from the early 90s wasn't feasible. It was 3D or bust. It's also important to note that, back home, there wasn't really a 'local' arcade (the closest was a 45 minute drive) so for the most part my arcade gaming was done in motorway service stations, on boats, and on holiday. And that one time I went to Sega World in London and played the hell out of Critter Crusher. Every encounter with an arcade machine was potentially my last! In this little arcade, there were two games that changed my mind about 2D games- one modern, one from the early 90s. Let's start with the 'classic' one- Cadillacs and Dinosaurs. A scrolling brawler by the masters of the genre, Capcom, released in 1993 and based on the Xenozoic Tales comic book series, it lacks some of the complexities of their later entries in the genre like the fantastic Alien Vs. Predator or their Dungeons & Dragons arcade games- if anything, it's closer to the more basic feel of Final Fight with added techniques like running and team attacks... What it does have is a crazy plot which is surprisingly faithful to the comics it's based on (evil poachers are hunting down dinosaurs, beat 'em up as one of four characters, then stop a mad scientist's dino experiments, also you can totally punch a T-Rex in the face) and a very firm grasp on the term 'over-the-top'. This isn't just in the graphics- which are very good for its time, including comic book-style sound effects displayed on-screen and smooth animation- but the game mechanics too. 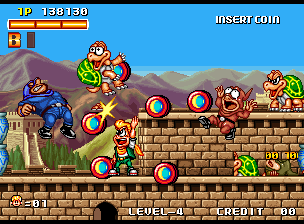 To start, in addition to the genre standard weapons like planks of wood and knives, you get to play with pistols, machine guns, grenades, and on one stage, a Cadillac car that you can use to just run everyone over in the stage. Hell, even your respawn animation is a weapon- rockets fall from the sky as you characters shouts "THEY'RE GONNA PAY FOR THIS!" and if you join in a game in progress, you'll spawn with a rocket launcher and ask your friend "NEED A HAND?". The enemies are similarly OTT, including fat poachers with a smoke permanently on the go, horrifying dino-human mutants, and actual dinosaurs that can be your friend and foe alike. 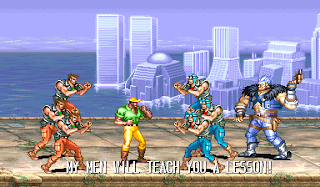 The main strength of the game is its frantic pace- techniques like running keep the speed of the game at maximum at all times, and constant scene changes mean it keeps its momentum going until the last stage. While it isn't the most complex brawler around, it has this charm, a result of its over-the-top nature and fast pace, that means you can't hold much against it. Before playing this gem, most of my scrolling brawler experience was the Streets of Rage series on the Mega Drive, which I enjoyed, so this was a graphical leap forward, and brought back memories of trashing phone booths and eating the roast chicken they left behind. Cadillacs & Dinosaurs helped rekindle my interest in the scrolling brawler- they're the genre I think of first when I think about video games- which lead to me finding similar arcade-only gems like Konami's Violent Storm and Winkysoft's Guardians/Denjin Makai II. 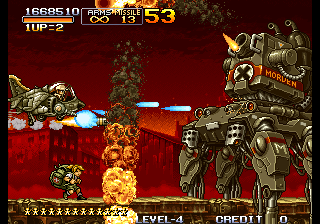 The other game at that arcade introduced me to what's one of my favourite developers these days, SNK- Metal Slug 2: Super Vehicle OO1/II. General Morden and his troops are eyeing up world conquest again, so you've got to stop them, one soldier/war machine at a time. Back then, I had never heard of the series, so I wouldn't have known that the first game was the work of Nazca, a bunch of ex-Irem employees whose collective credits included the likes of In the Hunt and Undercover Cops. Playing those games after Metal Slug is kinda weird because the graphical style is so similar! Metal Slug 2 takes the basics of its 1996 forefather- a run-and-gun influenced by Contra with a focus on vehicles (the eponymous Metal Slug, a jumping tank) found on each stage and a slightly odd sense of humour- and addsa few bells and whistles. For a start, you get to select from four characters- Marco and Tarma from the first game, and Fio and Eri- and this is worth mentioning because your choice of character makes absolutely no difference. It's just who you like the look of! (For the record, I always play as Fio). There's also new vehicles (including a camel and the Slugnoid, a bipedal suit of armour), new weapons (including the ultra-powerful Laser and Fire Bombs) and status ailments (eat too much and you'll get fat, and you can also turn into a mummy). All the additions from the previous title are just garnish to the main event- the basic game itself. Everything feels inherently right in a Metal Slug game- the control is fluid, it rarely feels unfair when you die (you're not paying attention!) and the massive bosses are some of the best in the genre. Playing in this arcade, I only ever reached beyond the second boss- a gigantic 'tower eater' that forces you to clamber to safety while pumping it full of lead... And getting the hell out of the way when it fires up its screen-feeling laser blast. The game also has my favourite boss fight of any video game, where at the very end you must team up with Morden's goons to take out the Mars People and their gigantic mothership- as Morden's troops help you with shields, tanks and even a Metal Slug, you can see an aerial battle wage on in the background, and the bombastic music in the background gives this fight an odd sense of camaraderie with the people you've been shooting for most of the game. That's rare! The last thing to mention about the game is how gorgeous it looks- this a hallmark of the series, especially in the early titles. It's easy to get distracted by the amazing sprite work! 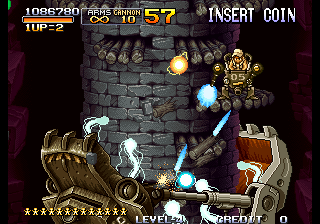 Metal Slug 2 is full of all sorts of lovely details- the baby crawling around the first stage, the hidden genie in the temple, soldiers lazing around on deck chairs and sipping drinks, the aliens on the final level dissolving into green goo... MS2 was my proper introduction to SNK (let's not count the Mega Drive port of Fatal Fury), and beyond their fighting games, I can't think of a better series to use as an introduction to them. Well, except perhaps Iron Tank. These weren't the only games in that arcade, mind you. 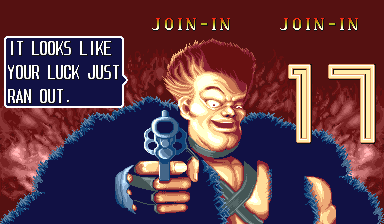 Considering what year it was, this place was slightly behind the times, as its roster included the likes of Sega's version of Tetris, Mitchell's Super Pang, Namco's sideshow lightgun game Point Blank, Data East's cartoony yo-yo adventure Spin Master, and another Capcom brawler, The Punisher. One arcade we found on this holiday even had Konami's Track & Field, all the way from 1983! 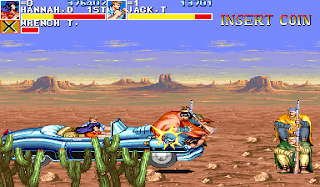 However, it's Metal Slug 2 and Cadillacs and Dinosaurs that had the most lasting effect- playing these games in that arcade kinda blew my mind, as sad as it sounds! I'd assumed that games like these- short, easy-to-pick up affairs- had seen their day, and the lengthier games emerging on the Playstation were going to be the standard of games from now on. The fact that Metal Slug 2 had been released that very year was what shocked me the most- there was still a place for games like this, and I needed to find more of them. Looking back at that time now, of course, it's obvious I hadn't done my homework, as games like this were still very much around, but this was in the pre-internet days (for me at least) where you couldn't look up games like DoDonPachi (released the previous year) and Armed Police Batrider (also 1998) in five minutes. The main impact these two games- and, let's be fair, the other games in that arcade- had on me was that they really defined my taste in games- a preference to arcade-style overkill and basic-but-satisfying game 'feel'. I want over-the-top action! Ridiculous over-sized bosses! Fairly simple but meticulously well-honed game mechanics! (That last one's probably the important bit). These are the kinds of things I think of when video games are brought up! They got me right back into this kind of gaming, and as soon as we returned from that holiday I began looking into getting the Mega Drive and NES collections back up to snuff, finding all the games I'd missed along the way, and finding out about companies like SNK and others like them- this included another pretty influential game and developer, as my brother loaded up a Mega Drive emulator and asked "Hey, you heard of this game? It's called Gunstar Heroes. It's kinda nuts, you wanna see?" when we got home. It'd be foolish to say that games with this ludicrous arcade spirit aren't still around- the Earth Defence Force series and anything put out by Platinum Games fly in the face of that, as do many others- and it's not that I solely play arcade-style games. It's just that those arcade-like qualities are what I look for in my vid-cons, and the source of it is that little arcade in Toranova. Or, I dunno, maybe I just really dig the sound chips on those arcade boards that you just don't get these days. Neo-Geo Sound Shock, am I right? As a post-script, years later we went back to Toranova, and that arcade had disappeared. In its place was a bootleg 30-in-1 MAME cabinet. Kinda fitting, I guess. Writer for RetroCollect.com (it's about old games you remember fondly) and owner of gaminghell.co.uk (it's about old games you've probably never played). Fan of video games (usually SNK, Data East and SEGA, and any smaller developers), the Touhous, and knitting. I'm with Rowdy Yates block! Who you fighting with?